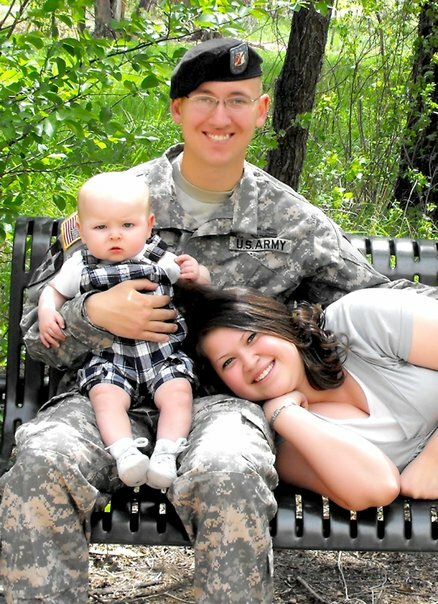 Michael, Alyssa and Connor before deployment. 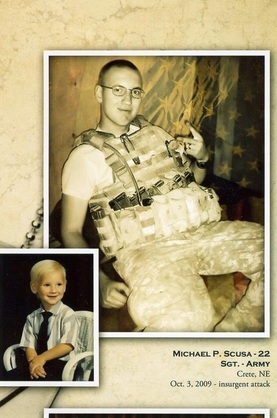 ​Hometown: Villas, New Jersey, U.S.
Died: October 3, 2009 in Operation Enduring Freedom. Unit: Army, 3rd Squadron, 61st Cavalry Regiment, 4th Brigade Combat Team, 4th Infantry Division,Fort Carson, Colo.
Sgt. Michael P. Scusa was born on October 5, 1986, in Lincoln, NE. He was killed in action on October 3, 2009 in Kamdesh, Afghanistan. Michael was raised in the lower township of Cape May, New Jersey and attended the Lower Cape May Regional High School. Michael always talked passionately about his drive to join the military and to serve his country. In 2005, he joined the armed forces and went to Fort Knox, Kentucky, for his basic training. 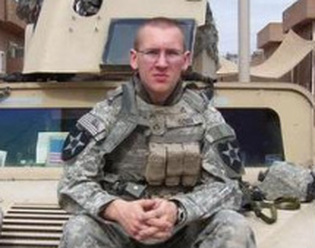 After being stationed at Fort Carson, Colorado, Michael was deployed to Iraq, back in October 2006, for fifteen months in support of Operation Iraqi Freedom. He enjoyed his role as Cavalry Scout and believed in his mission. He came home after a long deployment, and was told sixteen months later, he would deploying again in May 2009 in support of Operation Enduring Freedom, in Afghanistan. Their he was killed in action, when over 300 insurgents attacked their outpost, in the early morning of October 3, 2009, along side seven others. He is survived by his wife, Alyssa and his one year old little boy, Connor. His mother, Cynthia Woodard and four siblings, Susan, John, James Woodard and Kami Ruppert. Michael was laid to rest on October 16 2009, at Fort Logan National Cemetery, in Denver, Colorado. Now let us celebrate the life he lived, and honor the legacy he left behind. "to live in the hearts we leave behind is not to die." - Thomas Campbell. Obituary from Swan Law. At 0600 on 03 October 2009, Combat Outpost Keating, Kamdesh District, Nuristan Province, Afghanistan came under complex attack by an enemy force estimated at 400 fighters. The fighters occupied the high ground on all four sides of the COP and initiated the attack with concentrated fire from a B10 recoilless rifle, rocket-propelled grenades, DSHKAs, mortars, and small arms. Knowing that his unit was surrounded and taking effective fire, SGT Michael P. Scusa left the barracks to resupply the LRAS guard point. SGT Scusa, without hesitation, left the barracks to run ammunition resupply to a guard point that was fixed and black on ammunition. Running twice through 100 meters of heavy enemy fire, SPC Scusa returned to the barracks. Upon his return, he immediately picked up an additional load of 7.62mm ammunition to take to the outpost’s entry control point (ECP). Knowing that there was sniper and machine gun fire directly outside the door, SGT Scusa courageously ran out to resupply Soldier's from other sections and platoons. 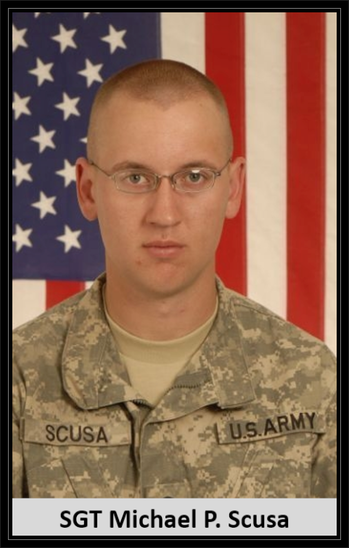 Upon moving to the ECP, SGT Scusa was killed in action under effective enemy sniper fire. SGT Scusa's actions allowed Blue Platoon to regain momentum and conduct a successful counter attack which destroyed remaining enemy forces on COP Keating. FOR EXCEPTIONAL VALOR ON 03 OCTOBER 2009 IN SUPPORT OF COP KEATING'S MAIN DEFENSE, SGT MICHAEL P. SCUSA EXEMPLIFIED THE SKILL AND BRAVERY OF A CAVALRY SCOUT. SGT SCUSA RAN OVER 100 METERS OF HEAVY ENEMY FIRE TO RESUPPLY A GUARD POINT THAT HAD EXHAUSTED ITS AMMUNITION. HE OBTAINED MORE AMMUNITION TO RESUPPLY THE NEXT GUARD POINT, AND RAN THROUGH AN ADDITIONAL 70 METERS OF RPG AND SNIPER FIRE WHERE HE WAS KILLED IN ACTION. SGT SCUSA'S ACTIONS ENABLED THE OUTPOST'S WESTERN GUARD POINT TO CONTINUE TO SUPPRESS THE ENEMY WHILE TWO OTHER CREWS WERE ABLE TO PULL BACK TO COVERED POSITIONS. SGT SCUSA'S DISCIPLINE AND BRAVERY BRINGS GREAT CREDIT UPON HIM, B TROOP, THE 3RD SQUADRON, 61ST CAVALRY REGIMENT, 4TH INFANTRY BRIGADE COMBAT TEAM, 4TH INFANTRY DIVISION AND THE UNITED STATES ARMY.